There’s really not much to be said for Crater Lake National Park except “WOW.” Seriously, everywhere you look as you hike around this intensely blue, breathtaking lake is awe-inspiring. 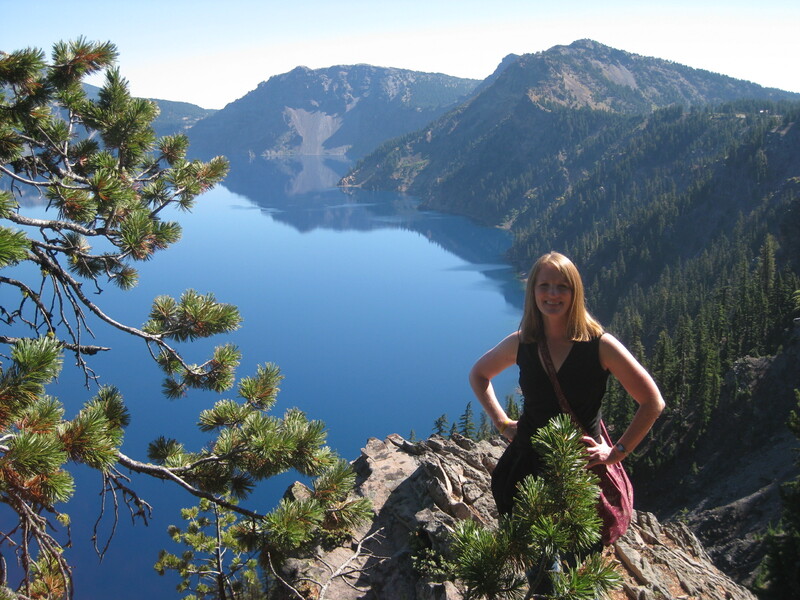 You can't go wrong with this hike around Crater Lake - what a view! Crater Lake has an interesting history. The lake is five miles wide and 1,943 feet deep, making it the deepest lake in the U.S. and one of the deepest in the world. Crater Lake is actually the remnants of Mount Mazama, a 12,000-foot tall volcano which erupted and collapsed into itself 7,700 years ago. 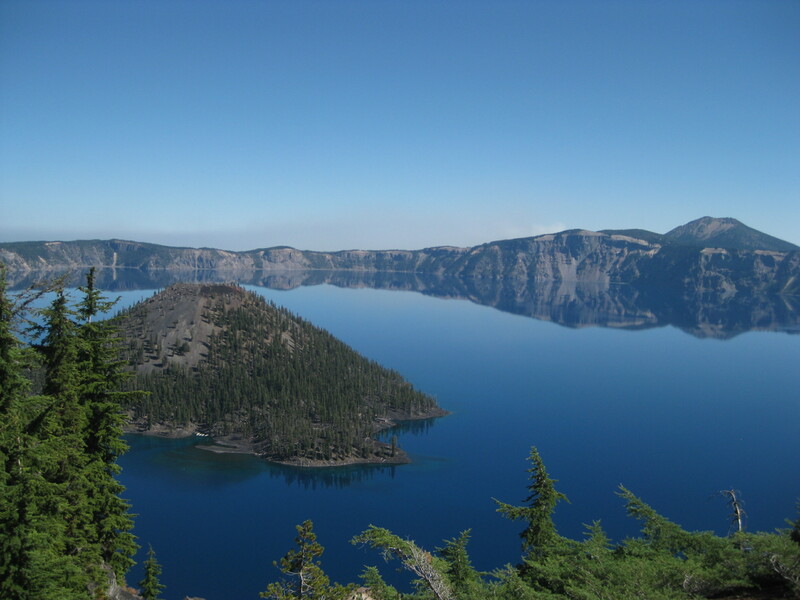 There are still four volcanoes, considered active, inside Crater Lake. Wizard Island is one that is visible. 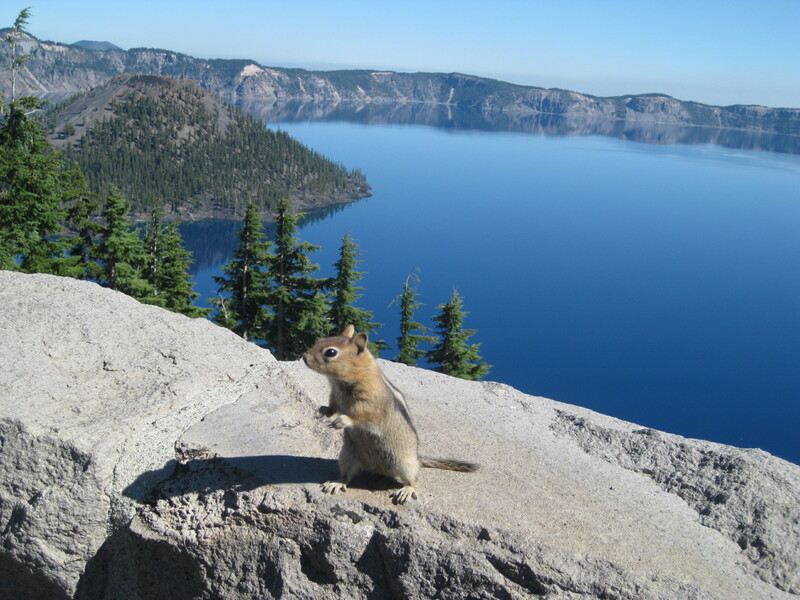 The U.S. Geological Survey installed seisometers at Crater Lake in 2009 to monitor activity, although scientists do not predict another eruption for years. I read an article in the U.S. Park Service newspaper that said, “…it’s sobering to realize that you are over 50 times more likely to witness a volcanic eruption during a 1-day visit to Crater Lake than to hit the jackpot with a $1 ticket in the Powerball lottery.” Huh. Good thing we visited when we did! Crater Lake National Park has an average snow fall of 45 feet! Thankfully, the day we went boasted clear blue skies, sunshine and a temperature around 80 degrees. The lake is fed by only rain and snow so considered to one of the cleanest in the world. You can take a boat to Wizard Island to hike to the summit, fish or swim. How cool! The trails around the ring of Crater Lake are pretty impressive, ranging from easy to difficult (with steep, rocky inclines), with views of the blue lake on one side and the Cascade Mountains on the other. We chose to hike Discovery Point Trail, which follows along the rim of the lake (at times pretty darn close to the edge!). It offered great views of the lake, Wizard Island and the Cascades. It was a fabulous, enjoyable day. Great company, great views, great weather and a great reminder of how amazing our country and environment is. I was once again grateful to share the experience with my equally nature-loving boyfriend and our travel companions. After leaving Crater Lake, we returned to Eugene for one last evening of fun with our friends. We returned to Portland on Saturday for our flight back to Detroit. Overall, we visited three states, drove 1,300 miles, explored miles of forests and coasts, shared many laughs, and made memories I’ll cherish forever. So many adventures (and great groups), so little time.